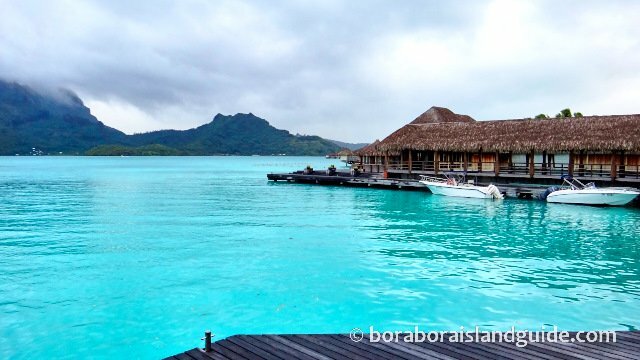 The Bora Bora Yacht Club faces the sunset. 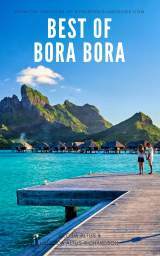 This overview compares the dining experience offered at each of the best Bora Bora restaurants to help you decide which to visit on your vacation. 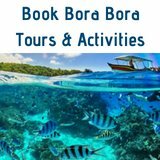 Bora Bora resorts have beautiful restaurants but it's also fun to get out in island paradise and eat at some of these iconic Bora Bora restaurants too. 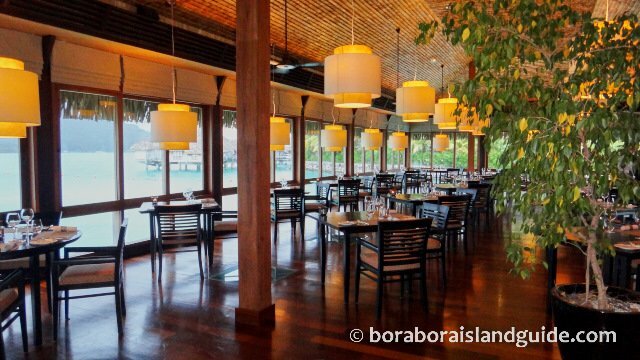 The Bora Bora Yacht Club restaurant in a relaxed lagoon-side setting. The menu offers a wide choice of dishes. 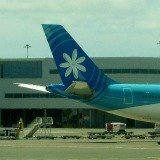 Many have a Polynesian focus with a French twist. Their specialty is seafood but if you're hungry for a succulent steak they provide that too. Burgers are popular at lunch time. We've experienced both good meals and mediocre fare when eating at the Yacht Club. Main courses are 1.900XPF/$20 to 2.400XPF/$25. 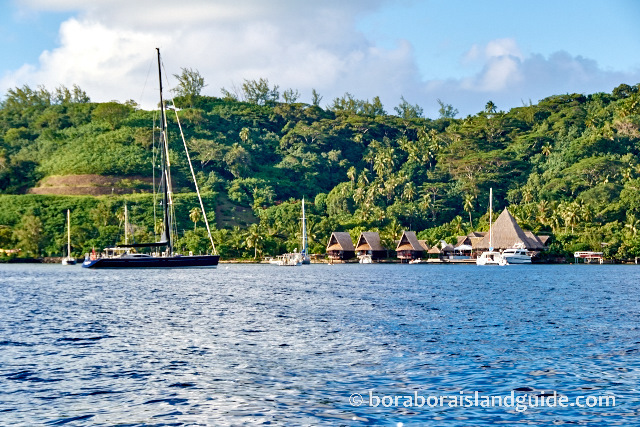 The Bora Bora Yacht Club is located lagoon side, a few minutes north of Vaitape. 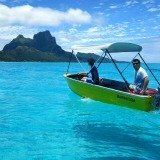 You can arrive by boat. Open for lunch and dinner. The St Regis Lagoon is reputed to be one of the best Bora Bora restaurants and strives to offer world class dining, over water, in a stunning ambiance. Go to the bar, before an early dinner, to enjoy the sunset. Unfortunately Lagoon is only open at night so darkness quickly veils the views. You'll have the best experience eating outside on the deck, under the stars, providing the weather makes this possible. 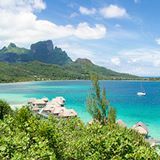 Having a meal here also provides the opportunity to visit the classy St Regis Bora Bora Resort which we find delightfully friendly. Prices for appetizers are 3.300XPF/$35, entrees/mains range from 4.100XPF/$44 to 5.600XPF/$60, and deserts are about 2.050XPF/$22. 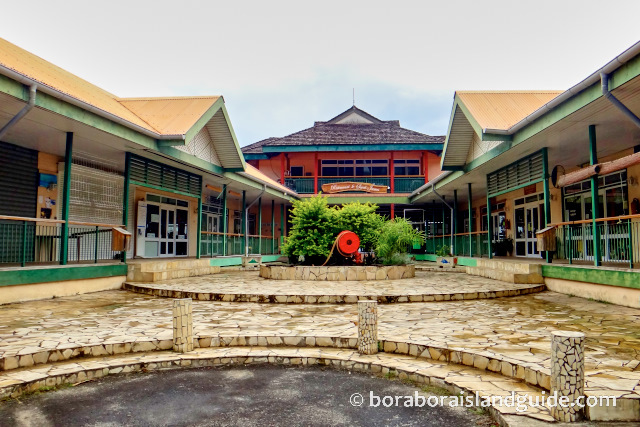 They're similar to Villa Mahana. St Regis is on Motu Ome'e. When you book, resort boat shuttle times need to be considered. There's one at 5pm. Lagoon is open 6pm for dinner. It's bar opens 5pm. Tel.60.78.88 or contact St Regis through it's website. At Villa Mahana, Damien Rinaldo Dovio, a Corsiacan chef de cuisine, offers a superb, gastronomic menu which is served in an arty, romantic setting. He has 6 tables out on the patio and moves them inside during rainy weather. A 7th table, in a private alcove, looks down on the garden courtyard. 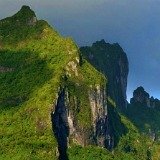 Influenced by his origins, Damien imaginatively combines local Polynesian ingredients with exotic spices, to magnify flavors. There's a wide selection of very special gourmet dishes to choose from. Expect to pay about 38.000XPF/$400 per couple if you have 3 courses and make a selection from his impressive French wine list. 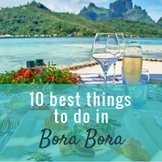 The unique Bora Bora dining experience is worth it! 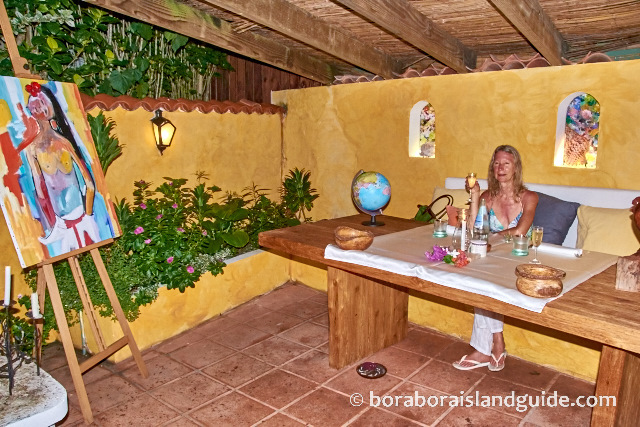 Damien offers less tables than other Bora Bora restaurants so book ahead if you want to taste his talent with food. 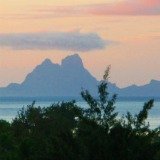 La villa Mahana is located on the mountain side between Vaitape and closed Hotel Bora Bora. Open Monday to Saturday for dinner only. Free pickup service. 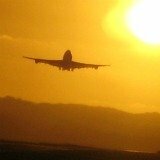 Reserve 2 months in advance for high season. Chef Teiva was born in Hawai and grew up in Tahiti. He studied French cuisine in Paris and has an American wife. So there's an American influence on the Polynesian inspired French fusion menu which features steak and seafood. Dishes change daily. Popular ones include the tuna platter, mahi mahi with vanilla sauce, and a tasty hamburger. The chocolate cake and mango & passion fruit cheese cake are tasty. MaiKai's staff can serve good meals for large parties. Maikai is on the side of the lagoon in the old Top Dive Hotel, but seating is indoors. There's a lounge bar (with a Maikai martini) where local French ex-pats and tourists hang out. A talented local band plays popular songs and you can dance between courses. 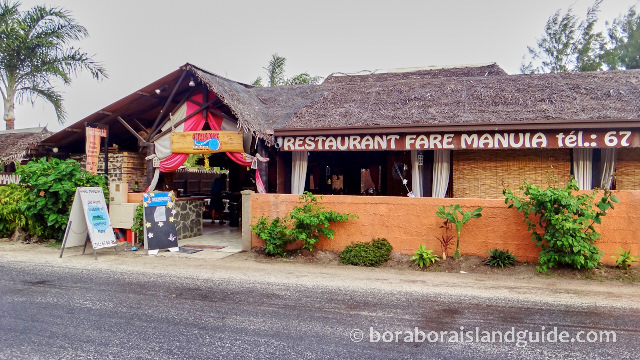 Prices are not cheap, but they're similar to some other Bora Bora restaurants. You can have a meal of shared salad, 2 main courses, and a desert for 9.400XPF/$100. Restaurant St James offers French Polynesian fusion style cooking, in a delightful lagoon side ambiance. Service is friendly and the food is beautifully presented and delicious (except on rare occasions when they are understaffed). Favorites include tuna 'prepared 4-ways' and a crème brulee trilogy of flavors. You can opt to dine indoors or alfresco on the deck above the lagoon. There's also a little fare for private, romantic dining. In the evening manta rays swim by, hoping for scraps. 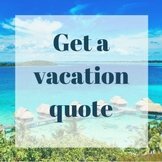 You'll pay around 22.500XPF/$240 per couple for cocktails, 2 courses and a bottle of wine. They also offer a simpler menu at lunchtime. 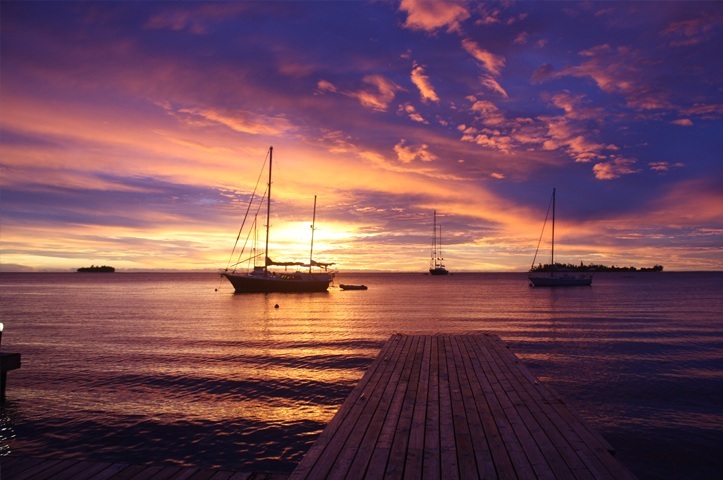 A romantic way to visit St James is through a sunset cruise that takes you onto the lagoon to watch the sun set with champagne and snacks and then drops you off at the waterfront of St James to enjoy a 3 course meal. 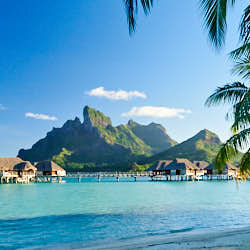 Bloody Mary's is the most famous of the Bora Bora restaurants and has become a main tourist attraction in Bora Bora. On arrival you are greeted with a board boasting names of celebrities who have dined here. 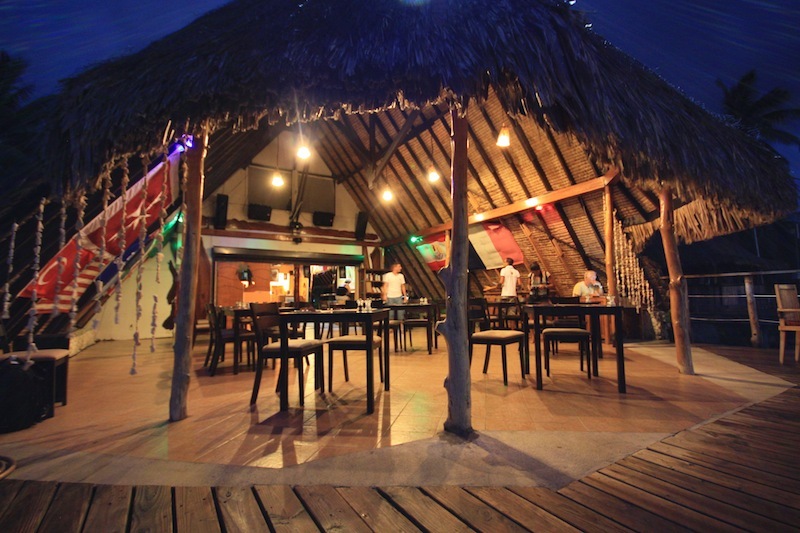 It's island-style décor with thatched roof, sand floor and tree trunk bar stools has a funky, casual atmosphere. Check out the surprise in the men's room that gets patrons whispering. At dinnertime the 'menu' is displayed on a bed of ice. Choose from a variety of seafood and a selection of New Zealand beef cuts, as you enter, and it will be charbroiled for you. Fresh fish costs 3.000XPF/$32, lobster is 8.000XPF/$85 and a beef meal is 3.000XPF/$32. It's easy to get a table here. Reviews of the food are so mixed that we've never eaten here. You don't have to have a meal to visit this icon. We stop by just for a cocktail on our way to or from stunning Matira beach. The house cocktail, a Bloody Mary, is only 650 XPF/$7. 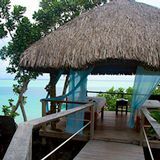 Bloody Mary's is located on the mountain side in Pofai Bay, just under a km before Matira Beach. Open for lunch and dinner Monday to Saturday and on boat days. Closed Christmas to 11th January. Bar open from 9.30am to 11pm. Free dinner transport from some locations. Fare Manuia - "Lucky House" in English - has a lovely atmosphere, serves good simple food, and has non-stop service. 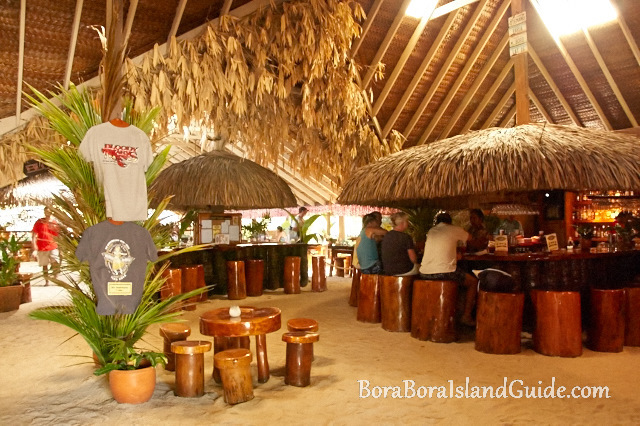 You'll meet more locals here than at any other of the Bora Bora restaurants. They gather here on Friday night. On the patio out the back there's a bar and a swimming pool which was bought from the closed Hotel Bora Bora. There's a cocktail of the day for 1.200XPF/$13. 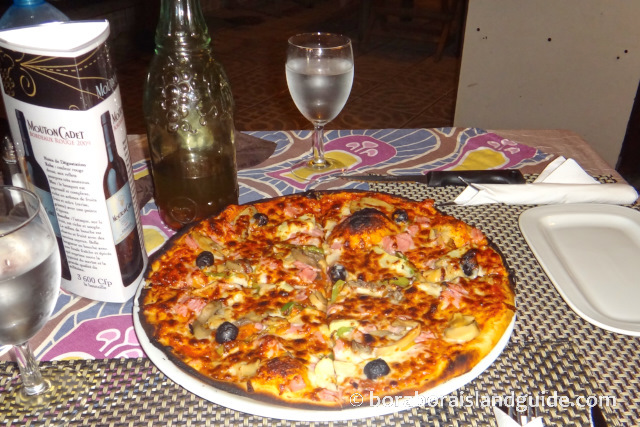 It has a wood fired pizza oven in the front terrace area and offers 28 pizza choices priced from 1.200XPF/$13 to 1.900XFP/$20. The day menu also has 15 different paninis and 15 types of burgers, all served with fries. 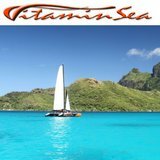 The dinner menu is a combination of gastronomic French cuisine and island specialties. Dishes start at 1.800XPF/$19 and a 3 course menu is 3.900XPF/$41. La Bounty offers a French menu in an island sand-floor décor which is a little tired. But it has an extensive menu with some delicious sauces. You can have a simple pizza, a tender beef rib or opt for shrimp, salmon or steak with a choice of sauces. 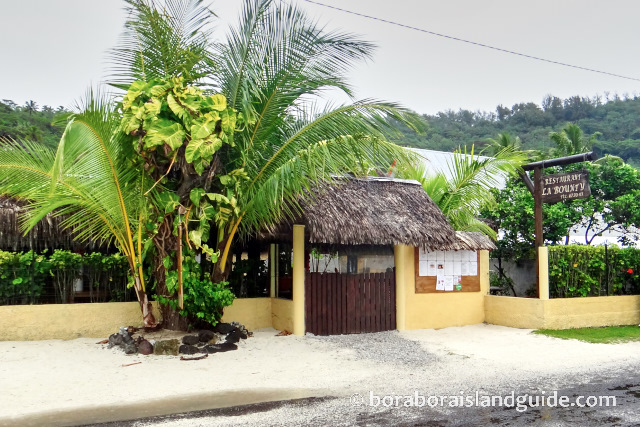 La Bounty is another of the Bora Bora restaurants frequented by French locals. The quality of the food and service depends on how busy the staff is. A large pizza is 1.500XPF/$16 and most entrees/mains cost $30. 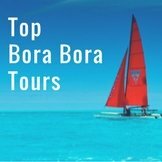 La Bounty is located a few minutes north from Point Matira, between Le Maitai and the Sofitel. It's also walking distance from Le Moana. It's open for lunch and dinner. Closed Monday. 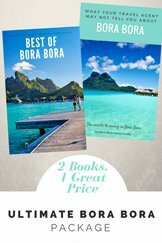 The Best Bora Bora restaurant? 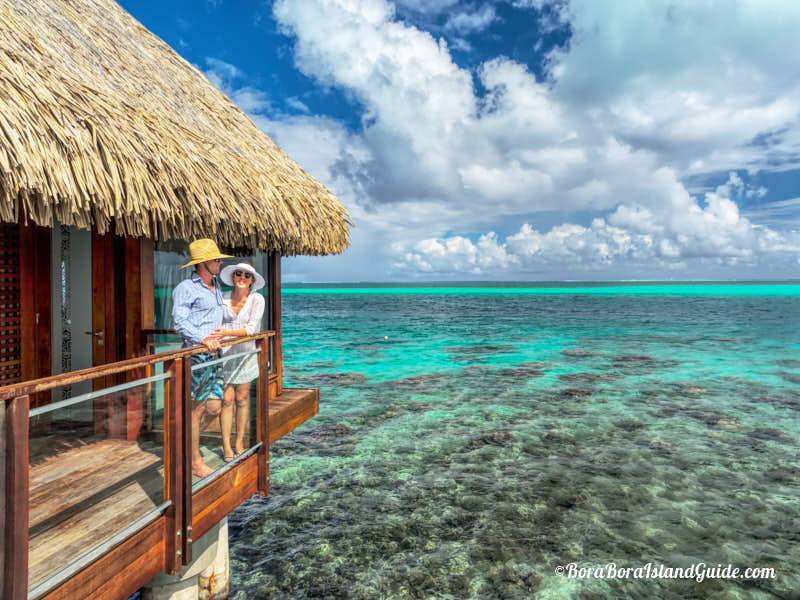 On our recent 2 week vacation in Bora Bora, St James won hands down! 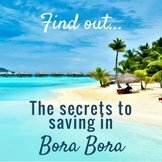 It's not cheap to eat at Bora Bora restaurants but it's important to understand that most of the food has been imported, and traveled long distances. 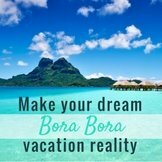 Because of the French presence in Bora Bora, wages are high too. We recommend choosing fresh, island foods and flavors as often as possible. Here's how to eat as the locals do. 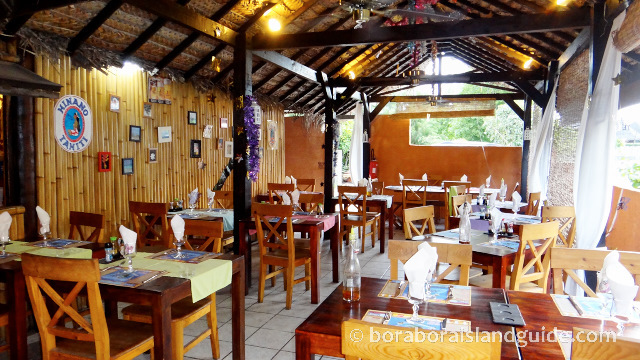 Bora Bora Island also has a variety of cafes where you can have lunch or dinner for cheaper prices.